While in Asheville, NC last week, I went to a Goodwill store. I very quickly noticed a lovely wooden instrument. 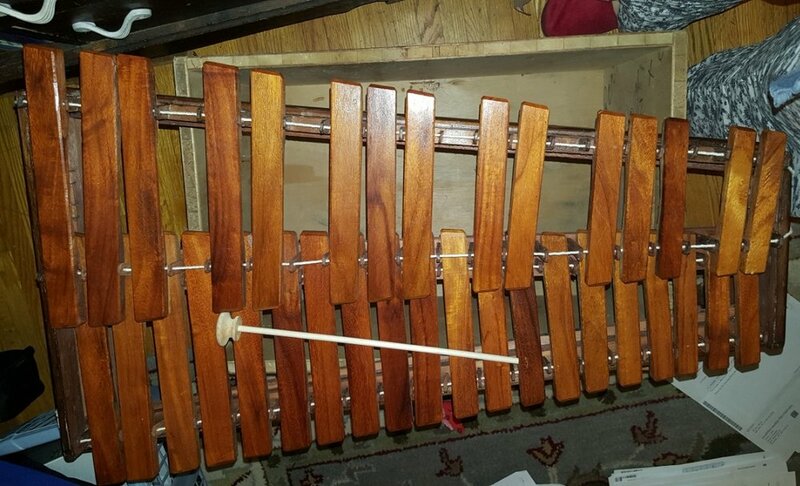 You might call it a xylophone or a glockenspiel, but this is neither; it is a marimba. I know this because it says Guatemala across the front of it. The marimba is the national instrument of Guatemala. I didn’t realize that, but Google can be very informative. There was no mallet, so I hit some of the keys with my fingernail. It sounded so pretty. The keys were smooth on the top and a little rough on the bottom; I thought they might be hand carved. I knew the platform it was on was handmade. I ran my hand across the keys and it was dusty. It had been a while since this instrument had been loved. "What is your back story?”, I thought, “Someone needs to love you again.” I wondered if it could be me. When I looked at the small end and saw the price, I said, “You are going home with me!” I carefully picked it up and put that beauty in my cart. It was two days before my birthday and I decided this would be a gift to myself. When I got home, I brought the marimba in my house and got out some wood cleaner and a soft rag. It took a little elbow grease, but, oh, she is pretty. I found a couple of small dowels and put wood knobs on the ends to make some makeshift mallets so I could truly hear the sound of the keys. I LOVE IT. Listening to it makes me happy. I have a new instrument to learn. I think that Google might help me out again with some tutorials. The only thing I know about my new marimba is that she was made in Guatemala. How she made it to the United States, North Carolina, and then to Asheville, I’ll never know — but what matters now is the moment. Oh, she is a pretty instrument! WARNING: Run on sentence ahead!! My computer! Good grief!! Do you ever hit buttons you are not supposed to hit or planning to hit and it causes your computer to do things you don’t want it to do OR it erases things you have worked on for several minutes and there is no way to get it back OR it freezes up and you have to hit the on/off switch to get it to shut down only to find out that you have now, once again, erased (go ahead and take a breath) everything you have worked on because you THOUGHT you saved it but in actuality you didn’t save it OR some weird popup window shows up and you hit the X to make it go away only to have another pop up come on the screen THEN you put your computer on the bed to get yourself a cup of tea so you can make a noble attempt to keep going because you have so much work to do but when you get back to the computer you find (go ahead and take another breath before you pass out) that your cat has been lying down on the keyboard and has not only typed a really weird and oh so random message but this feline has also, somehow, sent that message to a client? P.S. Please do NOT send this blog to the grammar police. With tomorrow being St. Valentine’s Day, I decided to make some comments about St. Valentine. I had little bits and pieces about him tucked away in a file in my brain. However, nothing came into clear focus, so off to Google I went to find out more about the man. Lo and behold, he was a multi-tasker! St. Valentine was the patron saint of lovers, epileptics, and beekeepers. "Huh? That’s an odd combination", I thought. But then I suppose we all do jobs, have hobbies, interests, and abilities that seem to be unrelated or out of character. Sometimes we do a job because it needs to be done. For instance, cleaning the bathroom. I do not enjoy cleaning the bathroom, but I do it because I love the people who will be using that bathroom (including myself). I also tat; I enjoy doing that, and I sometimes make tatted items for people I love. As I write this, my husband is doing some laundry — not his favorite job, but he does it because he loves me and it needs to be done. The more I think about it, it seems that the combination of people for whom St. Valentine was the patron saint might not be so odd after all. They are all people and they all need someone to care about them and love them. So, tomorrow is Valentine’s Day — why not do something for someone you love? Clean a bathroom, sweep a walkway, make a meal … do it just because everyone needs a little love. Another woman eats a salad while she reads a book. The cover reads Percy Jackson; I'll have to look that up later. In the far back corner, two women are having lunch together; one has brought in a medium-size clear plastic tote that is half full with papers, along with a tote bag that appears to be heavy with books. Both of the women have a note pad in front of them that they ignore as they eat. In this part of the restaurant, there are only women. But wait — now there is an elderly couple coming into the area. The woman is dressed in all black, including her purse, and carries a blue cane. The man leaves to get beverages and napkins. When he comes back, he spills a little bit of milky coffee. Two bagels are brought to them. They must be on an afternoon date. A third woman comes in walking quickly and joins the two women with notebooks in the corner. Their body language indicates that they have met before but not developed a friendship. Oh, there it goes: the woman with the tote is giving a presentation to the two other women. The elderly couple eats in silence. At the counter, a mother orders her food while her young daughter, who looks to be about 2 ½ years old, lies on the floor with a kid-protected electronic tablet. The little girl doesn’t want to get up. The mother picks her up. This has become a great people watching day. They all have stories, and today they all became part of mine. Hmmm, I wonder if anyone is watching me? Laugh about what you don't like! I got to thinking — what if we all just laughed about the things we don’t like? It might not make those things more appealing, but a good belly laugh is really good for your health. It relaxes you, reduces stress hormones, helps you to connect with other people, burns calories, and makes you feel good. So, next time you are faced with something you don’t like, laugh instead… you might live longer, which means you can spend more time on the things you do like! If you would like to learn even more about laughter, follow the links below!